The energy challenges of security, affordability and climate change are international issues that require local solutions. The last year has seen UCL Energy working on challenges in different countries including, the Mekong Delta, Oman, Guatemala and South Africa and hope to start soon in Ukraine. Working in other countries may sometimes be challenging, hence the publication by one of our recent successful PhD students Julia Tomei, “I always wore my machete when travelling on the bus”: reflections on danger in the field.”, but also tremendously rewarding. It has been interesting observing the differences and similarities the Oman faces in terms of its energy challenge. The last 40 years has seen energy use in Oman increase to similar per capita levels as the USA with residential use accounting for almost 50%, most of it in the form of electricity. Energy is very heavily subsidized in Oman, at something like 1/10th of the cost in the UK. This is similar to many Gulf Arab States where oil and gas dominate GDP but with an ever increasing share being used locally – and therefore unavailable for export. Energy efficiency has become an increasingly important topic in the Gulf States, which ironically may mean that it will be easier to implement there than in the UK! This is because the government subsidy for energy is so large that if government invests in energy efficiency it gets the benefits directly. Complex mechanisms such as Green Deal, ECO, etc. do not have to be invented. After having studied heating energy use for so long in the UK, getting to grips with cooling as the dominant domestic energy use takes time. 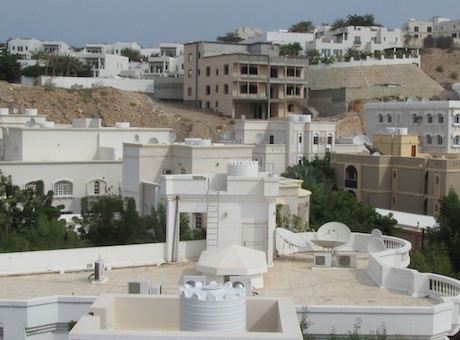 Unlike the UK where heating energy use is dominated by the size of buildings, in Oman it may be the case that energy use is dominated by number of occupants. This could be because in the UK we generally use central heating whereas in Oman individual room units are used for cooling. As part of our research we hope to work with governments to improve their energy efficiency and also reduce carbon emissions.